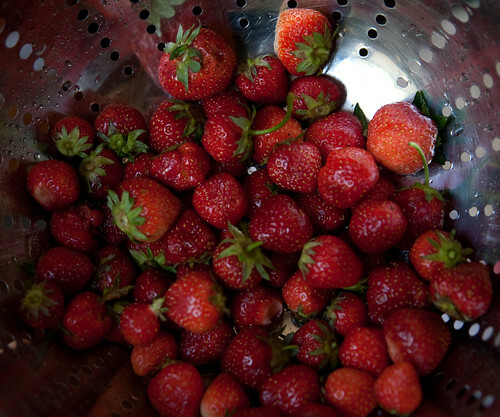 Friends have been talking about their visits to strawberry pick-your-own patches the past couple of weekends. We have a small patch at our own community garden, so I decided to harvest some ourselves to make a small batch of freezer jam before it’s too late. 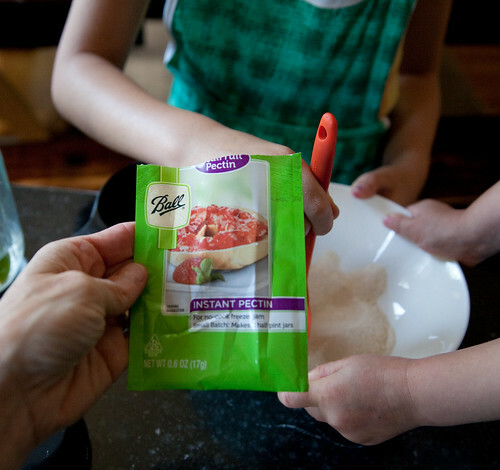 We only needed 1 and 2/3 a cup of crushed berries to make two 8 oz. 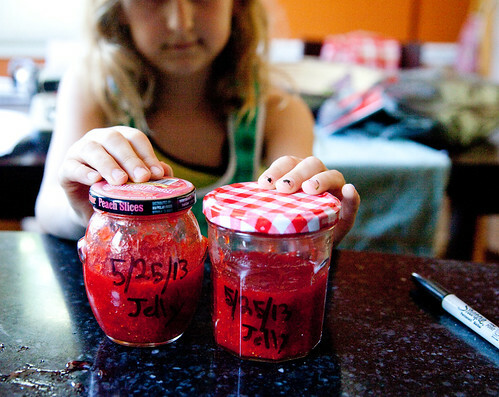 jars of jam, which seems a fair “take” for our family from the community strawberry patch. In a few days, many more still-green strawberries will take their place, ready for pickin’. I washed the berries, removed the stems, and then cut away any damaged bits. 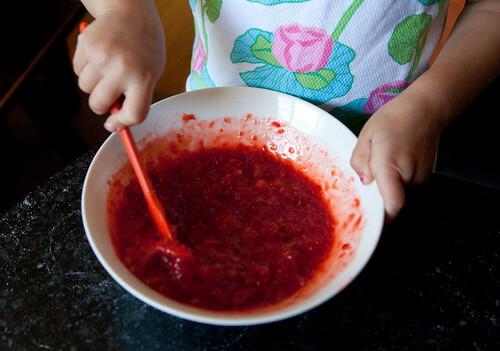 Then, the girls took turns using the potato masher to smoosh the strawberries into the consistency they prefer in their jam – not too many chunks, according to Ana. 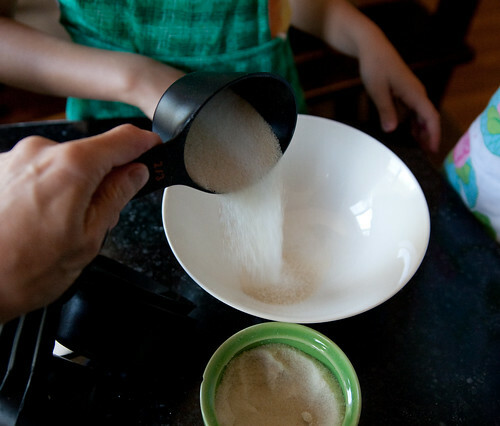 In another bowl, we mixed this instant pectin and 2/3 a cup of sugar. 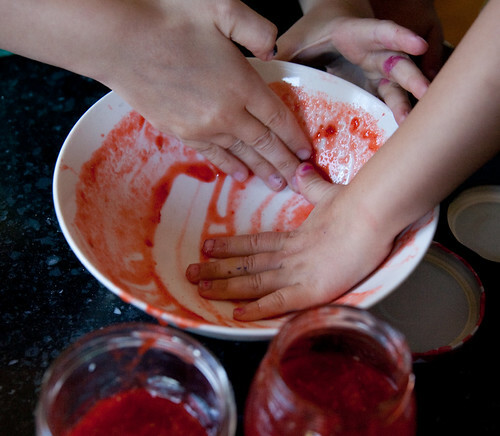 We mixed the pectin and sugar in with the strawberries and stirred for 3 whole minutes. 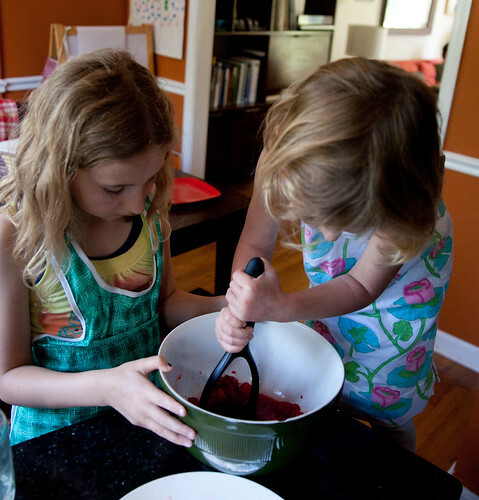 Then, I poured the jam into a couple of clean jars. We labeled the jars with a Sharpie and put them straight into the freezer to use when our current store-bought supply runs low. I’m told we can freeze the jam for a whole year. Then, take out and put in the frig. When it thaws, it’s ready to enjoy. The girls wasted no time licking the bowl clean. Next year, we’ll go to a pick-your-own farm and make many more jars. 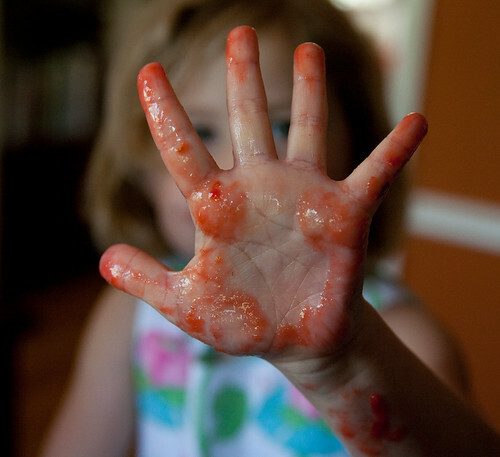 My Mom used to do that and I loved having her freezer jam on toast with butter on cold winter days. 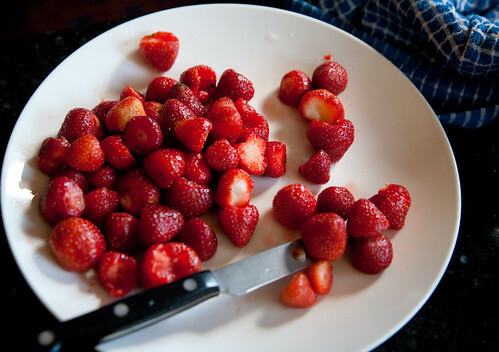 How are you enjoying the strawberry harvest this year? 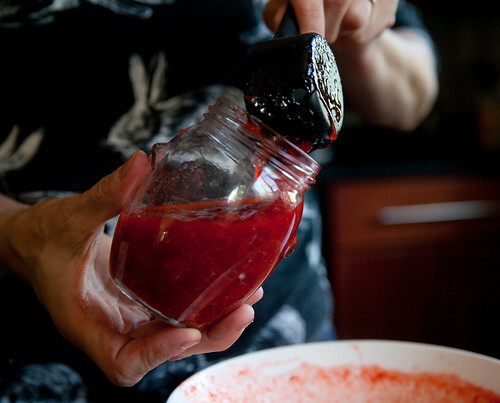 Thanks for this idea – I’ve been getting tons of strawberries in my CSA basket this year plus I love strawberry jam. It doesn’t taste quite like my Mom’s but nothing is as good – her oatmeal was better, her snickerdoodles, all of her cooking and baking far exceeds what I can do. But do try -it’s so easy and awesome to have in the middle of winter.